Prince Harry told the Archbishop of Canterbury he would take Meghan Markle to be his wife at a glittering display of royal pageantry that supporters hope will inject a measure of modern Hollywood glamour into the 1,000-year-old monarchy. “I will,” Harry answered when asked by Justin Welby, the leader of the Anglican Communion, if he would take Markle – dressed in a flowing white gown created by British designer Clare Waight Keller – to be his wife, to love her, comfort her, honor her and protect her. The declarations are being followed by a reading and the address, delivered by black U.S. bishop Michael Bruce Curry. 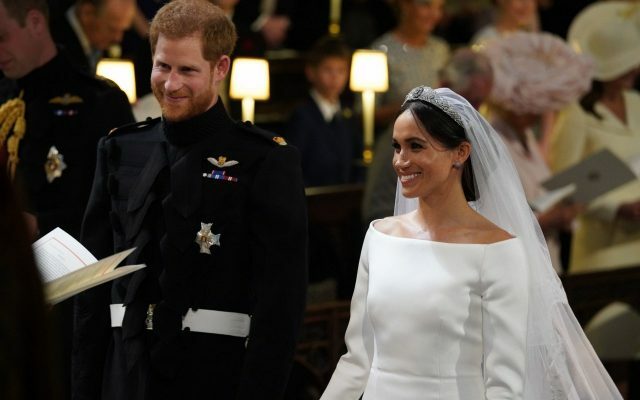 The couple then give their vows, exchange rings – a Welsh Gold ring for Markle and a platinum band for Harry – before the archbishop proclaims them husband and wife. After entering St George’s Chapel unescorted, Markle made her way towards the Quire, halfway down the church where Prince Charles walked her to his son, Harry. White roses, favorite flowers of Harry’s late mother Princess Diana, adorned the chapel. Markle’s mother, Doria Ragland, 61, appeared tearful. Prince Harry was dressed in a military frock coat uniform as was his brother, best man Prince William. Earlier Queen Elizabeth and Prince Philip arrived by car. Tens of thousands of fans lined the route Markle took towards the castle, waving British flags and cheering as the Rolls-Royce limousine drove past with the bride and her mother. Air traffic controllers for the nearby Heathrow Airport, one of the world’s busiest, said the air space over Windsor was being closed for 15 minutes before the ceremony. Hours before, Elizabeth bestowed the title of Duke of Sussex on her grandson, a step that means the American actress, star of the TV drama “Suits”, will become a duchess when she marries Harry. Under clear skies and glorious sunshine, a military band in scarlet uniforms and bearskin hats entertained excited fans gathered behind barriers. Police armed with semi-automatic rifles patrolling streets and watching from rooftops. “It’s absolutely incredible. The atmosphere here is just going to be crazy when Meghan turns up. I’m so pleased to be here,” said Charlotte Field, 21, one of 1,200 people invited into the grounds of the castle for the wedding. A host of guests were present. U.S. media mogul Oprah Winfrey and actor George Clooney and his wife Amal were joined by former soccer star David Beckham, his fashion designer wife Victoria and James Corden, the British host of the American TV chat show “The Late Late Show”. Other guests included tennis ace Serena Williams, the siblings of Harry’s late mother Princess Diana, singer Elton John, who sang at Diana’s 1997 funeral, British actor Idris Elba, and two of Harry’s ex-girlfriends.